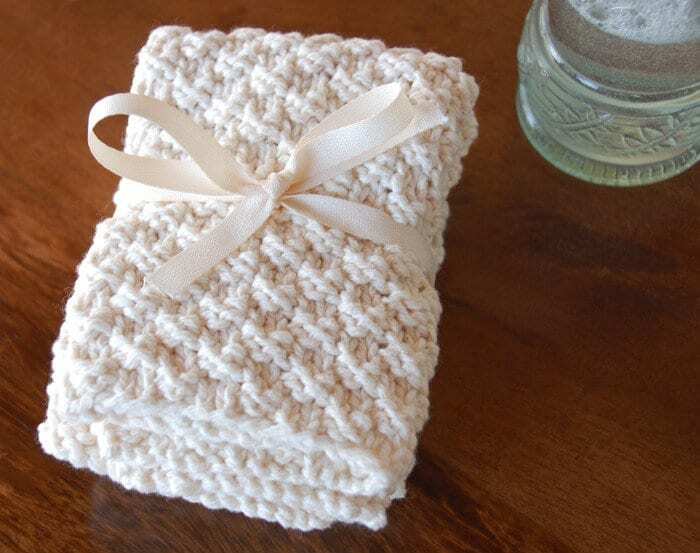 A very simple pattern for hand knit washcloths, perfect for gifting or for your own use. The other night my husband and I were guests of our friends at a basketball game. While the game was carrying on in front of us, my girlfriend and I were catching up on each other, our families and stuff in general. Somehow we migrated to chatting about hand knit washcloths or as some say knit dishcloths or perhaps dishcloths? (isn't that what you chat about at basketball games?). She was telling me about this great washcloth a friend had knit for her and she wanted to knit some herself. She came over the next day with the washcloth and we figured out the yarn and needle used, as well as the pattern. I love that they look like there are little hearts in the pattern. I was eager to get started on these great washcloths, they are the kind of knit project I'm looking for these days. 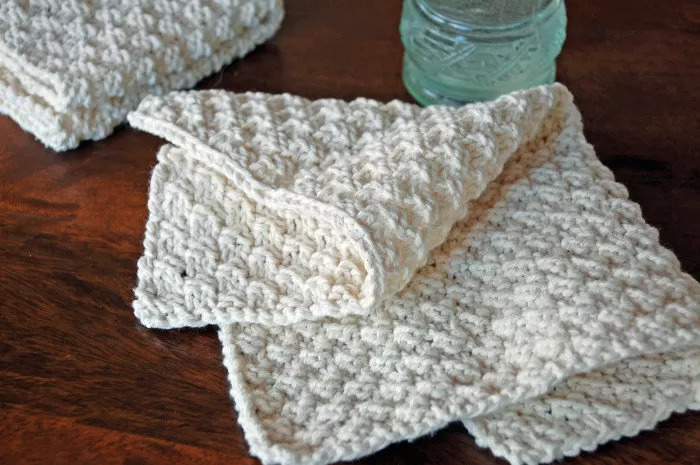 As I've said before, I need to have something to do while on car trips, sitting in front of the TV or sitting in the carpool line, and these washcloths fit that bill. They are a quick knit (read…semi-immediate gratification) and don't require my undivided attention. I used 100% cotton yarn for these washcloths. Cotton is far more absorbent than a polyester, so is a good material for a washcloth. The yarn is a worsted weight and I used size 6 needles. These hand knit washcloths measure 11 inches by 11 inches. Adjust your cast on if you want something smaller or bigger. I find them the perfect size. Gauge of 4 stitches and 6 rows to the inch. Repeat these 4 rows until your piece measures 11 inches. Bind off and tuck in your loose yarn. Here's a round-up of some great items to accompany your hand knit washcloth if you're looking to gift them. However you decide to ‘gift' your hand knit washcloths, you can be assured that the recipient will be thrilled. If you want more washcloth or dishcloth patterns, pop over here to see more knit & crochet patterns. In general, you want an unmercerized cotton as the mercerization process makes less absorbent material. So, if you’d like to get in on the ‘subscriber benefit’ action, simply subscribe to Nourish and Nestle using the form on the right sidebar. It’s towards the top a bit. Or you can just click here. I have sent all my subscribers the link to the Subscriber Benefits Library, but if you missed it or misplaced it, drop me a line and I'll get it right to you. I’d stay with a worsted weight. The yarn I used for the washcloth would be fine, but you could also use something with some alpaca in it. I’ve used the Berroco Modern Cotton which was softer than the yarn for the washcloth, but did not have alpaca in it. I’d use a size 7 or 8 needle, solely because its a bigger piece. I’d check my gauge with whatever size needle I chose. I’m guessing I’d end up casting on 120 or so stitches. I hope this helps! If you do make the baby blanket, please let me know how it turned out and I’d love to see a picture! Happy Knitting. BTW…what did you do to make sure you were working on the right row. That was my biggest problem with this patter…I’d get busy knitting and lose track of what row I was supposed to be on…not a big row marker user. Did you just use row markers? Thanks, Lynn, for your ideas! I will certainly try making a baby blanket using this pattern. I have searched high and low for something different and unique. Also, I love that it is reversible!! FYI: when I’m knitting I keep the pattern right in front of me so I can refer to it at all times. Also, I make sure I complete the 4 row pattern before putting it down. Never used a row marker. 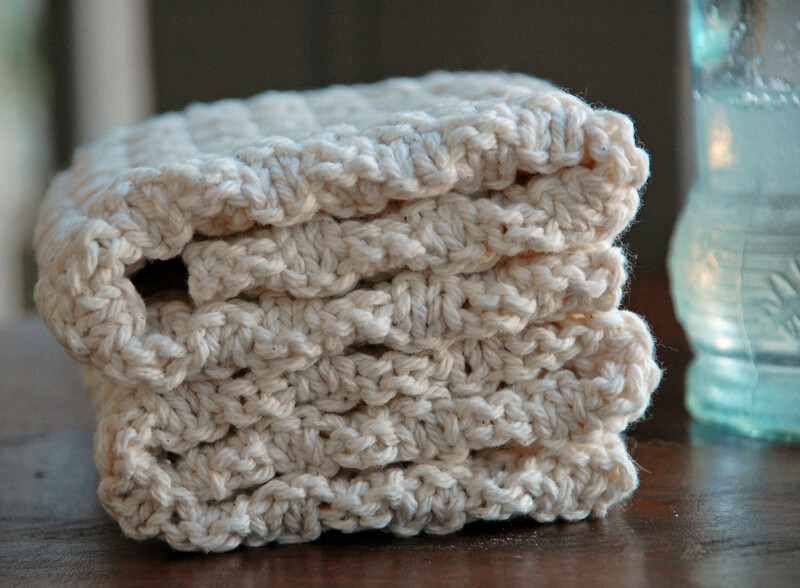 I found making these washcloths to be instead gratification, i can’t wait to knit and it is very relaxing. Thanks so much! Thanks for sharing these patterns. The washcloths are all so lovely and fun to make. Sue, you are so very welcome and hope you have a great time knitting! Thanks for stopping by and sharing your kind words. Beautiful stuff on your site! Love it!! Aw thanks Carole! I very much appreciate your kind words and support. Hope you come back and visit again soon! Fairly new to knitting… can I scale this to make a smaller dish cloth or scale up and what do I scale the number of stitches by? Does it just have to be an even number? Hi Thacia, yes…you can scale up or down and just need to have an even number of stitches. Happy Knitting! You are so welcome Earlena! I hope you enjoy knitting them as much as I did and be sure to pop back in if you have further questions. How do you knit pictures and words on a dishcloth/block? Here’s a link for intarsia. You’ve made me realize that I should do a post on this topic!! What is the gauge for for your washcloths pattern? I don’t see them on the patterns’ page. Thanks for pointing that out Jasmine! It is 2 stitches and 2 rows per inch. How big should my gauge be?I’m still confused on it.How big was your gauge? Hi Jasmine, so because the gauge is 2 stitches and 2 rows per inch, it’s really up to you how long to make it. For instance, if you knit a 6 inch by 6 inch gauge, then you should have 12 stitches across and 12 rows within that 6 by 6 swatch. Does that make sense? My travels have slowed down and I’ll be home now and it’ll be easier to answer questions, so ask away my friend. For adjusting the stitch count, I found it worked to do multiples of 4 plus 2 to keep with the pattern. Otherwise, just going with even meant that I was not getting the last two stitches of the repeating pattern before the last stitch. I’m just learning to knit (avid crocheter! ), so perhaps I’m wrong, but it worked for me! That’s exactly right Sarah! You do need that multiple of 4 plus 2 to stay in pattern. Thanks for pointing that out my friend. Have a great weekend knitting and crocheting! Hello! I’m working on one of these now and I’m quite pleased with how it is turning it out. Thank you for the pattern. I’m wondering how do you care for them once finished? Do you put them in washer/dryer on normal settings? Hi Kate…I put mine through the washer and dryer…that cotton holds up real well! And your tip about keeping track is a great one! Thanks for sharing it, my friend. Also – in response to a comment upthread re: how to keep track of where you are in the pattern. I keep a pad and pen close by. When I take a break I leave a note to myself “Start with row X (1,2,3 or 4)”. I use the same note over and over and just cross out the last “X” and replace it as needed. Simple but it works. Great tip! Thanks for sharing it my friend. Hi Jeanne! I got tired of knitting sweaters that may or may not get worn, so have switched over to blankets and washcloths…which always seem useful. So glad you found some patterns you like my friend. I have been knitting dishcloths using the basic corner to corner pattern for years now, and am ready to try some different ones. Your washcloths are so pretty and look almost as easy as the pattern I use. I can’t wait to start on them. My main reason for writing, however, is to tell you that your instructions, with pictures, are the clearest and easiest to follow that I have ever seen on any site. (And that includes video instructions, which can sometimes be confusing.) Thank you. I am thrilled to have found your site. Wowza!!!! What a lovely way to start my day! Thanks so much, BetteAnn…it is always a struggle to make sure that I make instructions as clear to everyone as possible and it really makes me feel good that you think I might have achieved that goal. I hope that you are having fun making a stash of knitted washcloths! So I just finished this washcloth but am not sure how to bind off. Do I follow row one’s knit and purl pattern and bind off respectively? Or can I just go with a straight knit bind off? I’ve never purled a bind off before so I guess that’s why I’m confused. 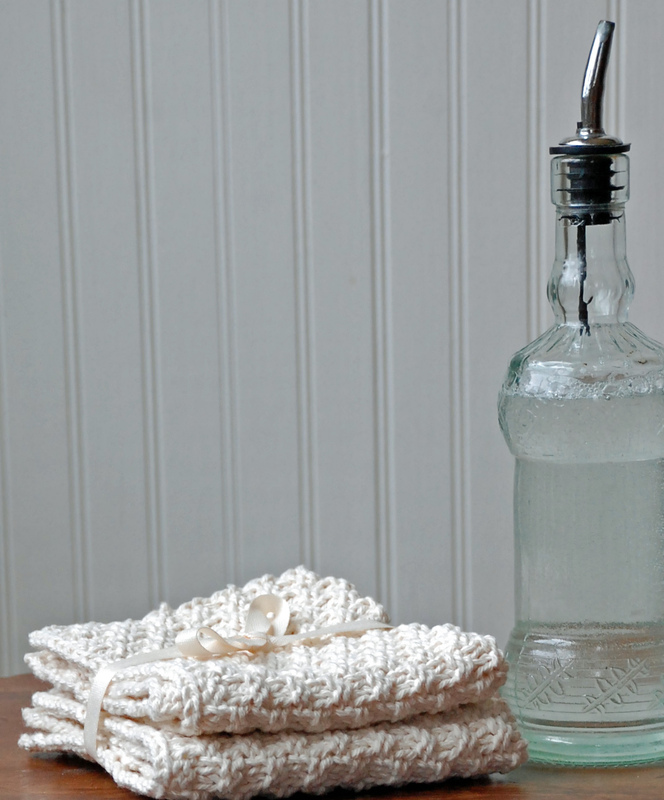 Love these washcloth instructions-so glad to have found your site as well! At the end of the day, it is up to you. But, I would bind off in pattern, meaning bind off in the knit and purl. It is really easy and will help prevent that bind off the edge from flaring out. Step 1: Knit your first stitch as normal. Step 2: Purl your second stitch as normal. Step 3: Slip the first stitch over the second stitch. Step 5: Slip stitch over the new stitch. Step 7: Slip stitch over the new stitch. Step 8: Repeat until you have one stitch on your needle. Come back and let me know how it worked for you! And I’m so glad you found me too! I’m very happy you are here! I have super duper wash merino wool leftover fro. A project. Do you think I can use this for a washcloth? Thanks for your post. Live your pattern and ideas for gifting! To be honest, I have never knit a washcloth with anything other than cotton, so I can’t say for sure. But, my gut is that you probably don’t want to knit a washcloth with wool, even the superwash. I would imagine it would take forever to dry and then you’d end up with a funky smelling cloth. I completely understand your desire to use up partial ball…but think for these I’d just get an inexpensive 100% cotton ball. That being said, if you do decide to give the wool a whirl (see what I did there? ), do let me know how it works as a washcloth material.